NEW DELHI: Newly appointed railway minister Mukul Roy announced a rollback in some of the rail fares that were announced last week in the Rail Budget. Mukul Roy told Parliament that fares for first and second class passengers in air-conditioned carriages would still go up, but there would be no increase for other classes of travel more commonly used by the poor. "The proposal to increase (fares) will impact the common man," Roy said. "I intend to give relief by not increasing fares in any of these classes." The proposed increase in passenger fares, the first in eight years, was aimed at shoring up the finances of a rail network whose dysfunction has become a major drag on the economy. The objection to the increase, led by UPA ally Trinamool Congress, underscored the inability of Manmohan Singh's government to take unpopular steps and its vulnerability in the face of querulous coalition allies. Saying it was important to run railways economically and safely, Roy announced there would be no increase in passenger fares. 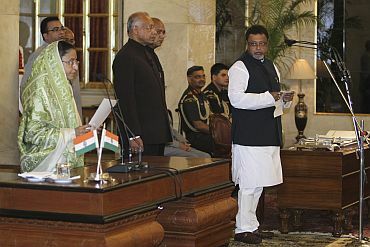 Mukul Roy also said he intends to launch an aggressive drive to mop up resources for the railways. Unmanned level crossing to be removed, he said. Former railway minister Dinesh Trivedi, who had announced an increase in passenger fares across all classes in the Rail Budget on March 14, faced a lot of flak from Trinamool chief Mamata Banerjee and was forced to resign over the issue a few days later.